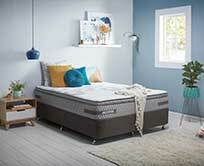 Sealy is Australia’s favourite mattress brand, and have been in the business of beds in Australia since 1923. Sealy offers the perfect blend of support, comfort and durability, while offering a wide range of mattresses and bases to suit your needs No aspect of quality is left to chance, and is thoroughly tested to help ensure you get the best night’s sleep possible. Sealy products are available in all sizes, and can be ordered with or without a base. Step up to a Sealy Posturepedic Enhance mattress and foundation. The Enhance range has been engineered and constructed using world class design practices and rigorous testing techniques. Luxurious fabrics are used to finish the mattress, and provide a stunning furniture piece for your sleep haven. You can also enjoy superior conformance for the lower back area with ComfortCore® Gel Memory foam, located across the centre third of the mattress. With all the features you can expect from Australia's most preferred bed, the Aspire Collection has superior features, quality and durability with our Posturepedic support. It is designed to support your life with the revolutionary support, comfort and durability that only Sealy Posturepedic can deliver. With a soft-to-touch knit on top of the mattress, the Aspire collection presents an aesthetically beautiful sleep system for those who value a restful night's sleep.